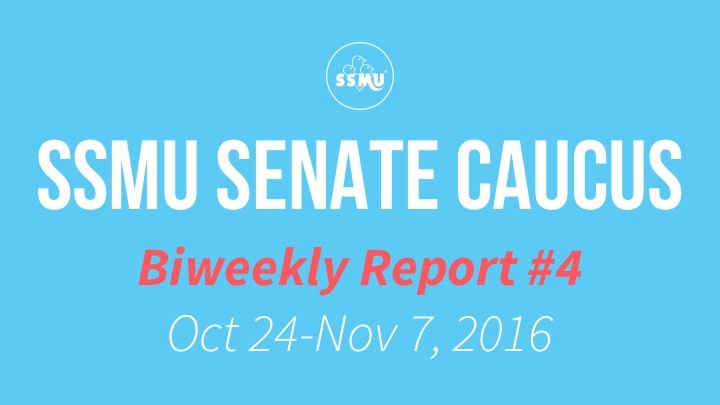 It’s already November, and the SSMU Senators’ fourth biweekly report is here! You can also find our previous biweekly reports here. Welcoming the recently-elected VP University Affairs of MacDonald Campus Students’ Society (MCSS), Jade Corriveau, to SSMU Senate Caucus. Here’s to a stronger connection between Mac and the Downtown Campuses in important student issues! Her reports are included in the PDF. Angela Campbell (Associate Provost, Policies, Procedures, and Equity) and Christopher Manfredi (Provost) came in to Caucus for a Q&A about the Policy Against Sexual Violence. 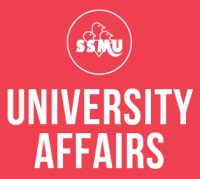 We asked questions loosely based on the consultation report recently published by SSMU and PGSS. The Provost also claimed that the Office of Sexual Violence Response, Support, and Education will most likely start operating by the Winter term, if the policy were to pass in Senate this November as planned. We discussed the Non-Smoking Policy at McGill, and responses from different parties on campus.